One of the better films in the series, this one has some cool plot twists and some fantastic action. 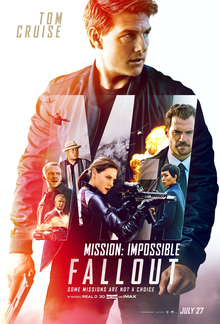 This is a solid Mission Impossible film, with some of the better stunts and action scenes in the series. The plot is pretty strong too. It gets creative this time, with having Ethan Hunt have to break out the man who in the last movie he helped put away. The movie has strong characters and moves at a nice pace, but it is a little longer and more complicated than it needs to be. On top of that, we’ve reached a point with these movies, (this one being the sixth film in the series,) where the Mission films generally have some of the same beats, making them at times predictable. This movie has at least two such scenes, where you just know that everything you’re watching is fake or a ruse. Still, this is a lively and smart action movie, and like the last three films in the series, it is another major success. Mission Impossible: Fallout is another fun entry into the series. It’s a good movie that holds a place alongside some of the better films here, which is a big statement considering how great the more recent movies have been. The first two movies were some of the weaker in the series, and that’s an odd statement, considering the first one was a pretty good film. But it’s a testament to how great these movies ended up getting. The second movie was awful, but then after that, the series suddenly got launched to a whole new level. Starting with the third movie, they went from average B movies with a big budget to smart action thrillers. The third movie was fantastic, (and what I still consider to be the best in the series.) Then came the subtitled films, and they were also great.. No more Mission Impossible II or III, but instead, we got Ghost Protocol and Rogue Nation. Both were terrific. And now Fallout ranks right alongside them. These movies are all packed with surprise twists and amazing action, which keeps the adrenaline pumping the whole way through. In Mission Impossible Fallout, the movie opens with a dream sequence (to reintroduce us to both Solomon Lane, the villain, and Julia, the ex-wife.) After that we are at an exchange that goes horribly wrong. The opening dialogue, between the MI team members, (Simon Pegg, Ving Rhames, and Tom Cruise,) is awkward and unfunny. They stand around talking about who’s nervous and who’s hiding that they are nervous, and who’s not nervous, but excited instead. It’s the worst dialogue in the movie, and really the only awkward scene in the film. The buyers of this plutonium show up to make a deal and a shootout ensues. When Ethan Hunt, (Cruise,) has to run out to rescue one of his team members, he returns to his car to find that the plutonium is gone. And that leads us to our first trick. It involves a weapons maker who is working with the villain team, called The Apostles. In the last movie, we met Lane, (Sean Harris,) a villain and leader of a team called The Syndicate. Now, those team members have become the Apostles, and have a mission to destroy some of the major countries of the world. This storyline is a little too James Bond-ish, (infact, the Syndicate is a lot like the evil organization Spectre in those Daniel Craig films.) But at least these movies never reach levels of Bond ridiculousness. Ethan is sent to infiltrate a meeting where the Apostles will be selling the plutonium to a man at a dance club party. So Ethan and his team head to the party, and this time they are joined by a new agent named Walker, (Henry Cavil,) who works for the CIA. The new director of the CIA is Angela Bassett, and she doesn’t like how Ethan let the plutonium go. She sends Walker along with Ethan this time, to make sure that kind of thing does not happen again. The team boards a plane, gets up into the sky, and Ethan and Walker do the first major stunt of the movie…a halo jump. This is a high tech version of skydiving, but what makes it amazing is the way the camera tracks them through the air, holding onto a single shot, as the camera moves all around them, for as long as possible. The scene looks fantastic. Everything from them starting in the plane and walking around on the plane floor, passing each other, to their descent through the sky is shot brilliantly and looks absolutely fantastic. The characters end up in the night club, and visit the men’s room where they find their target. This leads to a huge bathroom fight, and some pretty cool hand to hand combat action. It also leads to them being joined by Agent Ilsa Faust, (Rebecca Fergusson.) She was a major character in the last movie, (like Lane,) and she’s back too. This movie was written and directed by Christopher Mcquarie, who also directed the last movie. He’s the first director to ever return to the series for two movies in a row, and what Mcquarrie does here is he gives us the closest thing to a sequel that the series has ever seen. The stories of both Ilsa and Lane are continued here, as if this were a part two. The buying of the plutonium doesn’t go as planned, when the Apostles attack at a bar, and suddenly the mission changes. The new mission is to break Solomon Lane out of his holding cell and turn him over to the people who have the plutonium. It’s not quite that simple, (the people who want Lane aren’t necessarily working for him, but just might want him because they want revenge for crimes he’s committed on them in the past.) But the new situation involves breaking Lane out from a convoy of armored vehicles. And Hunt gets his team to take on this task. The idea that in the last movie Hunt had to catch Lane and put him away, and then in this movie he has to break Lane out, is pretty cool. And it leads to some incredible action scenes. We get all kinds of lengthy chases from care chases to motorcycle chases to foot chases to helicopter chases. The only thing missing is boats. And each chase is packed with incredible choreography. So Hunt rides his motorcycle on a chase around the massive traffic circle at the Arch du Triumph in Paris, and we get an amazing scene out of it. The last movie also featured both car and motorcycle chases, and they were great there too, but this one definitely ups the ante. 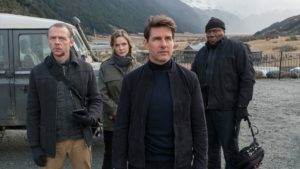 The storyline, and idea that Hunt must break out Lane is pretty good, but as the movie goes on, we start to realize that a Mission Impossible film generally has the same beats. And that makes them kind of predictable. One of these examples is that whenever the team members get into a big argument in front of another person, you can be sure that the argument is fake, and that they are doing it in order to fool the person about something. This happens a number of times in the movie, starting with that first twist about the weapons maker. Another idea that has become routine in the movie is the use of masks. You can never trust who someone really is, going back to the very first movie, and sometimes this idea is used to accomplish fantastic ideas, (like in the third movie, where they kidnapped the villain.) Here it’s used pretty clever. While the action is fantastic, and absolutely some of the best in the entire series, the movie also wants to do a little too much. Chases go on a little too long, and there’s a bomb diffusing sequence at the end of the movie which doesn’t seem to understand that we’ve seen bomb diffusing scenes in movies tons of times before. It’s a tired cliche. This movie splits its team members up into groups in order to give us three different stories at once. They don’t all work. The Hunt scenes are naturally the best, and the Simon Pegg – Rebecca Fergusson scenes are good too. But in this movie Luther is the odd man out. His bomb diffusing story just isn’t as interesting or entertaining as what the others are dealing with. And that’a really the only problem with the movie. It’s too long and too overly complicated. Yes, we need the twists and turns, but this movie gives us a few too many shady organizations or weapons buyers, and that leads to things becoming more confusing then they should be. But the actors all hit it out of the park, (including newcomer Henry Cavill, who plays Walker,) and the action is just incredible. There hasn’t been a stunt quite as good as the Burge Khalifa building hang from the fourth movie, but this movie definitely has more action than those other films. And the scenes it gives us are out of this world, featuring not just amazing stunts, but also super scenic locations. It all contributes to another major success for this series.